Christmas merits a dinner of decadence. This year, it was just my husband and myself, so I figured burgers would be perfect to make for a party of two. I scored some elk meat from a colleague and wanted to bust it out for a special occasion - Jesus's birthday? This wild game came from Montana, which made me think of huckleberries - in BBQ form of course. Being that it was Christmas day, I opened up the bottle of Glühwein gifted from the Proprietor of a German Inn we stayed in in Indianapolis on our road trip from California to Pennsylvania. Ironically, the last time I had a burger was in Indianapolis, about three months ago. I used some of the wine to deglaze the onions, giving them a spicy-sweet depth of flavor. I added aged cheddar for a creamy salty contrast and finally, homemade brioche buns to hold everything together. Elk meat is ultra lean, but this round was ground was blended with pork fat for an ultra rich and juicy result. These burgers were so lustful! 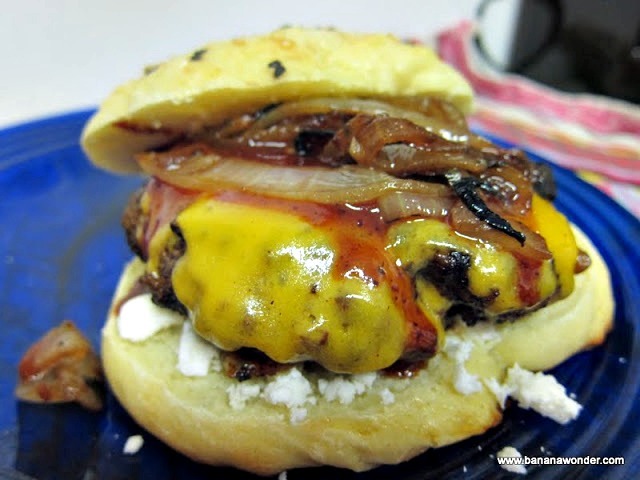 I admit, I added feta to these burgers. I couldn't help myself. For a Christmas dinner, it wouldn't be complete without a little feta somehow, somewhere. All in all, I am not a burger maker - but these were hands down the best burgers I've ever made. Admittedly, I went into a coma after eating this dinner. In a skillet on medium high heat, add some olive oil and the onions. Cook onions for about 5 minutes until they start getting blackened. Add some of the wine to deglaze. Lower heat, and continue cooking on a medium heat for 10-15 more minutes, adding more wine as you go. Blend BBQ, garlic, and jam in a food processor and blend until smooth. Set aside for later. Form patties making sure they are flattened in order to cook evenly and fit the bun. Heat non-stick skillet to medium high, add olive oil, fry patty for about 10 minutes on each side. Add cheese on top of burgers for the last few minutes until melted. Split the brioche buns, add feta (if you want) to the bottom. 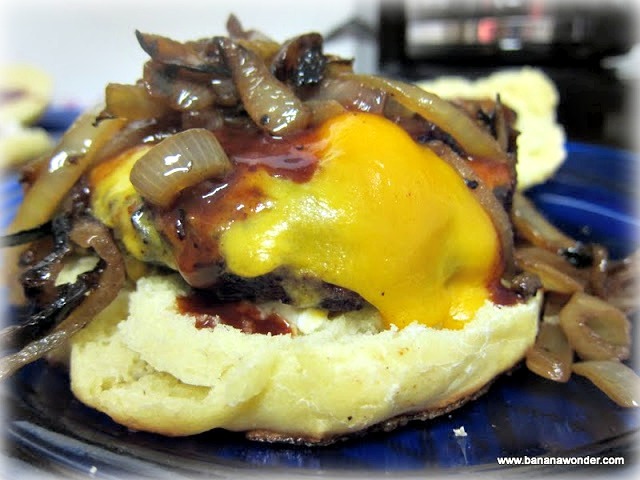 Top with burger, BBQ sauce and onions. Add more BBQ if needed. Get messy! I was in Montana a decade ago on vacation and FedExed a lot of huckleberry stuff to my grandmother, who loved huckleberry. But she was in a home then, she had the first stages of Alzheimer's, and she was so excited to get presents from me that she gave it all away and didn't get any herself. This is just mouth-watering! We don't have elk here but I could try it with kangaroo maybe? The gluhwein caramelised onions are just inspired! JustinM - as long as I got your approval, burger master. Ah, so funny/tragic about your grandma! My brother lives close to Montana and people go crazy picking them at certain times of the year - they are a delicacy indeed! Anna - I would LOVE to try some kang. My friend who lived in Australia for a year was just telling me about the kang meat everywhere... that would be like us eating venison like it was no big deal. You guys do it right! [url=http://www.canadagoosehommes.com]canada goose toronto[/url] Hammertoe is the deformity of the 2nd, 3rd, or 4th toes. Either you purchase high heel shoes or normal but those must be comfortable in your foot. http://www.salemulberryshop.co.uk Absolutely nothing. Yet another thing that drew these girls to the mills, was an education. The Frye Belted Harness Mule is very sleek and super cool. You can pick out any of these to go with your dressing style and to increase elegance to your fashionable looks. [url=http://www.soldesgoosefr.com]Canada Goose Langford Parka[/url] You may even want to invest in non commercial or farming properties.